Welcome back to The Rundown! I hope your holidays were merry, your meals were festive, your parties were rocking, and everyone made it home safely! Are we ready to knock off some of those holiday meals with an uptempo workout? Canada West women's hockey resumed this weekend as the second-half schedule got underway, and there were some solid matchups to begin the second half. A battle for first-place? A team possibly moving into second-place? All sorts of jockeying for fourth-place through sixth-place? An upset or two? The second-half already has storylines so let's get into them on this week's edition of The Rundown! If there's one thing that you may expect after a break, it's that the teams come back rested and ready to go. The Cougars and Pronghorns certainly made that true as Lethbridge's Alicia Anderson and Regina's Morgan Baker decided to put on a little goaltending clinic for their teammates in the opening game of this two-game set. The first period was all blanks despite both teams doing all they could to try and score on the two netminders. Despite Regina leading 14-10 in shots through the opening 20 minutes, the game remained 0-0 thanks to the work of Anderson and Baker. Regina's Martina Maskova was whistled for a bodycheck early in the middle frame, and that sent Lethbridge to the power-play where they would strike! Katelyn Breitkreuz fed a perfect pass across to Kyra Greig who one-timed a blast low past the lad of Baker at 3:01 to give Lethbridge the 1-0 lead on her power-play marker! Regina would ramp up the offence after that as they looked to equalize, but Anderson stood tall once more in the blue paint, helping the Pronghorns hold that one-goal lead through 40 minutes of play despite being outshot 21-13. The third period saw Regina start with a power-play that carried over from late in the second period, but Anderson was having none of that. There were two additional early calls that went against the Pronghorns as well, but the Lethbridge penalty-killers and Anderson turned the Cougars away time after time. Lethbridge shut down the middle of the ice, kept pucks to the outside out of danger areas, and did everything they needed to in earning the 1-0 win over the Cougars in Regina! Anderson pitched her fifth shutout of the season to earn her fifth win of the season in stopping all 27 pucks she faced while Morgan Baker suffered the loss despite stopping 15 of 16 shots sent her way. SATURDAY: Lethbridge's win on Friday moved them to six points behind the fifth-place Cougars and just four points back of the sixth-place Mount Royal Cougars, so there was a lot on the line in Saturday's game when it came to competing for playoff spots. Could Lethbridge pull off the sweep and really put pressure on the three teams ahead of them or would Regina rally for the split and restore the gap between them and the Pronghorns? It would be up to Alicia Anderson from Lethbridge and Jane Kish from Regina to backstop their teams to victory. The game was somewhat like the night before as both teams came out looking for chances, but Regina would fall into some penalty trouble midway through the period. Kish and the Regina penalty-killing units would come up big and shift the momentum back to the home side in which they forced Lethbridge into a hooking penalty to negate the remaining few seconds on the second of two Regina penalties. That would prove big because moments after Elise Endicott got out of the box, the Cougars power-play struck when Jaycee Magwood somehow found room between Anderson and the post from below the goal line at 16:33 to put Regina out in front 1-0! That score would hold into the intermission after Jane Kish closed the door on Alli Borrow late on a breakaway as the Cougars maintained their first lead of 2019. The Pronghorns found themselves in a bit of a pickle in the second period as four straight penalties were called on them in the middle stanza. As a result, the penalty killers got an extended workout with Regina having eight minutes of extra attacker time. The good news? Regina was only able to capitalize on one of those four power-plays. Jaycee Magwood and Lilla Carpenter-Boesch played a little give-and-go on the left side before Magwood beat Anderson with a backhander that put the Cougars up 2-0 at 12:45 on Magwood's second power-play marker of the game. While Regina poured on the offence in a period where they outshot Lethbridge 13-3, they could only muster the one goal to send them into the second intermission with the 2-0 lead. Early in the third period with all sorts of traffic in front of Anderson, Regina defender Tamara McVannel threw a shot into the crowd and it pinballed past Anderson to make it 3-0 with Emma Waldenberger getting credit for the goal as the bumper at 5:51. Lethbridge stormed back less than two minutes later when Jodi Gentile's slapshot was stopped by Kish, but Alli Borrow popped the rebound past her at 7:56 to make it a 3-1 game. Anderson would make her mark on the comeback as well, robbing a pair of Cougars with some absolute thievery as she kept the deficit to two goals. That seemed to spark the Pronghorns late as a pair of Cougars were sent to the box and Anderson went to the bench to set up the 6-on-3 attack where Borrow found Kyra Greig with a backdoor pass at 17:15 to make it a 3-2 game! Lethbridge continued to press with time counting down, and a glorious chance was blocked by Ireland South with seconds remaining that helped Regina hold onto the 3-2 victory! Kish made 18 saves in her sixth victory while Anderson was on the losing end of a 23-save performance. This series had some interesting stories as UBC was looking to track down Manitoba in the standings while Mount Royal had a chance to move from sixth-place into as high as fourth-place depending on other results. Both teams needed points, and it would be up to UBC's Tory Micklash and MRU's Zoe De Beauville to prevent the other from taking them from their respective teams. 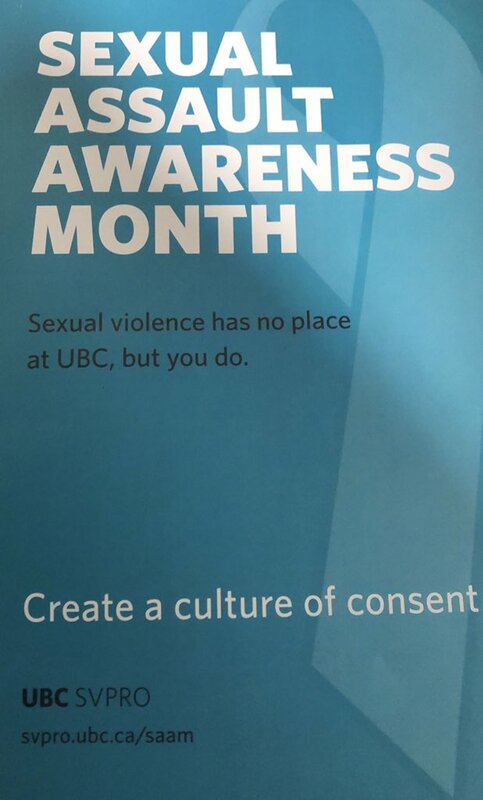 UBC was also hosting Sexual Assault Awareness Month on Friday night as UBC forward Shiayli Toni organized the night's information tables for all in attendance to visit. If there's one thing that cannot be stressed enough after all we've seen in the media and on the news, it's that sexual assault victims usually have trouble coming forward to share what happened to them. As the shirts worn by volunteers stated on this night, "We Believe You". That can't be stressed enough, so kudos to the excellent work by Miss Toni on organising this evening! On the ice, the two teams looked to break out of their holiday routines early, but it was UBC who showed good puck possession and ways to get pucks to the net as they outshot the Cougars 12-5. The only problem is that none of those shots found the twine in the opening period, so we'd move to the second period tied 0-0. The period started much the same until UBC was whistled for a call. That penalty was killed, however, and it seemed to give life to the T-Birds as they began to skate a little harder. They'd draw a penalty when Tatum Amy committed a trip, and the UBC power-play took to the ice where a face-off win back to Celine Tardif was blasted by the defender and tipped in front by Hannah Clayton-Carroll past De Beauville for the power-play goal and the 1-0 lead at 7:43. Again, that seemed to spark UBC as they danced into the zone three minutes later and Emma Hall found Rylind MacKinnon with a cross-ice pass that MacKinnon made no mistake with as she buried the shot to put UBC up 2-0 at 10:43! The Cougars, sensing this game may be slipping away, decided to mount a little offence of their own when Tianna Ko skated the puck into the UBC end and spotted Tatum Amy. Her cross-ice pass was tape-to-tape with Amy, and Amy's shot went over the shoulder of Micklash at 15:56 to make this a one-goal game. That 2-1 UBC lead would hold through the remainder of the period, and we were off to the third! The final frame saw both teams with chances, but the netminding of Micklash and De Beauville wouldn't allow another puck past. In saying that, you've likely already concluded that UBC held onto that 2-1 lead to victory, and you'd be right! Micklash earned her eighth win of the season in stopping 12 shots while De Beauville made 29 stops in the loss. SATURDAY: If the game one night earlier was tightly-contested, Saturday's game one-upped the previous night. 13 minor penalties were called in the game - 7 against UBC and 6 against MRU - but the power-play units for either side were hardly effective. UBC opted to start Amelia Boughn while Mount Royal surprised many by giving Emma Pincott her first start and appearance of the season. And in a rather unique twist, it appears that Pincott shed her traditional #35 tonight for a rarely-seen #78 on her jersey if the boxscore is to be believed! The two teams really put on a defensive showcase in the first period as shots were blocked, chances were limited to the outside, and the goalies took care of the few chances that did get through to them. After 20 minutes of play, UBC held a slight lead in shots at 5-4, but the score remained 0-0 despite MRU having three power-plays and UBC having two of their own. Three more power-plays for either side in the second period was part of the story, but it was one UBC penalty that made all the difference as Tiffany Chiu was sent off for interference at 15:58. The ensuing Mount Royal power-play saw Tatum Amy spot a streaking Tianna Ko from below the goal line, and Amy's pass was of surgical precision as she threaded the needle to Ko who redirected the puck past Boughn at 17:02 to put the Cougars up 1-0 at 17:02! The Cougars would take that lead into the second intermission despite being outshot 13-8! The story in the third period was Emma Pincott as she continued to stymie the UBC attack. She was brilliant in helping the Cougars snap a UBC 15-game winning streak against them that stretched back to 2012-13 as Mount Royal prevailed by that 1-0 score! Pincott, in her first start this season, earned her first win and first shutout in denying all 21 shots she faced while Boughn took the loss in a ten-save effort. The Dinos came into Saskatchewan needing wins if the playoffs were going to be a remote possibility this season. The Huskies, for their part, needed wins to stay ahead of both Regina and Mount Royal, so these games had meaning for both teams as the second-half kicked off in Saskatoon. The other interesting thing is that Saskatchewan opened the second half of the schedule in some unique uniforms as it was Play For A Cure night at Merlis Belsher Place! 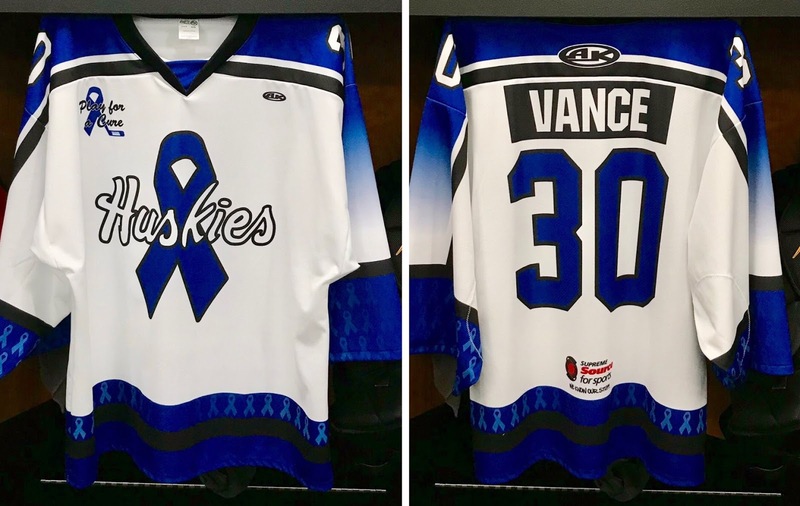 The ladies played host to a raffle for a number of key prizes while auctioning off these special jerseys all game long with all proceeds going to the Canadian Cancer Society's volunteer driver program! Well done, Huskies, on looking fabulous and doing an outstanding job in helping a very worthy cause! The two teams played a rather quiet first period with both sides trading power-play chances. Kelsey Roberts stopped all four shots sent her way while Jessica Vance was equal to the task on the six shots she faced with an Emily Upgang breakaway being the only real quality scoring chance of the frame. Through 20 minutes, the score remain knotted up at 0-0. Calgary took an early penalty in the second period where the Huskies had chances once more, but Roberts and the Dinos' defence stood tall in killing off that penalty. They'd do the same thing again midway through the period, but it would be the fourth trip to the penalty box that cost the Dinos. Leah Bohlken spotted Emily Upgang on the backdoor and slid a cross-crease pass over to the awaiting Upgang who redirected the puck past a prone Roberts to put the Huskies up 1-0 at 17:02 with the power-play marker! After two periods, Saskatchewan had the one-goal lead thanks to a 21-4 shots advantage in the middle frame! The teams wouldn't find much more scoring early in the third period, and Calgary missed an opportunity on the power-play to tie the game. As time pressed on, the Huskies seemed in control of the period as they had possession for long periods of time. A late power-play saw Leah Bohlken fire home a cross-ice pass from Bailee Bourassa to put the Huskies up 2-0 at 18:02, and Kennedy Brown would ice the game with 16 seconds to play with an empty-netter to give Saskatchewan the 3-0 victory. Jessica Vance posted her fourth blank sheet and seventh win of the season in stopping all 11 shots she faced while Kelsey Roberts was fantastic in a losing effort in 30 saves, 20 of which came in the second period alone! As always, here's your obligatory Huskies GIF. SATURDAY: Calgary's loss the night previous night was a serious blow to their playoff hopes, but not all was lost yet as a split with the Huskies would still be a positive result. Saskatchewan was looking to distance themselves from the pack in the hope that they may host a playoff series, so this was a big night for them when it came to points. Surprisingly, both teams went with their backup netminders in this one as Calgary called upon Kira Wasylak while Saskatchewan opted to start rookie Camryn Drever! Calgary came out as the team with some spark as they created chances early, and they were rewarded for that aggressive play. Priya Sidhu drove down the wing before centering a pass to Taylor Beck that Drever kicked aside with her pad, but Diane Hitchings was in the perfect spot to gather the rebound and chip it past the Saskatchewan netminder at 4:44 to put the Dinos up 1-0! That seemed to wake up the Huskies as they dominated the remainder of the period. It would be a late power-play, though, that got them even on the scoreboard after peppering Wasylak for most of the frame. Shyan Elias' point shot was stopped, but Abby Shirley was on the doorstep to shovel the backhander home past Wasylak at 15:41 to make it a 1-1 contest through 20 minutes of play. The second period started the same as the first did as Calgary grabbed a lead. Sage Desjardins picked up a loose puck caused by the turnover created by Rachel Paul, and she wired a a wrister high over the glove of Drever at 6:02 to put the Dinos back out in front by a 2-1 margin! Saskatchewan's offence didn't quite have the same room to operate as they did in the first period, and it seemed like the Dinos would escape to the intermission with their lead intact. However, a late press by the Huskies saw the cycle game working well enough to spring Elias to the middle where her shot was stopped, but Shirley was there to clean up the rebound once again as she roofed the puck over Wasylak to make it 2-2 at 19:12! With the score deadlocked at 2-2 to start the third period, both teams stepped up the offence as they looked to pick up three points in the standings. Unfortunately for Calgary, the only penalty called in the third period was against them and it cost them. With Carley Wlad watching from the sin bin, a goalmouth scramble saw the puck pop loose in front of the far post where Leah Bohlken stood, and she poked the puck home at 14:07 to put the Huskies up 3-2 with the power-play marker! The final five minutes saw Drever stand tall as her and the Huskies defended that one-goal lead until the final horn as they claimed victory by that 3-2 score! Camryn Drever made 15 saves for her third win of the season while Kira Wasylak made 28 stops in the loss. Once again, a Huskies GIF for your enjoyment! The marquee match-up of the weekend had all the traits of a heavyweight fight as the second-ranked Manitoba Bisons hosted the fourth-ranked Alberta Pandas in a series that likely would determine who will win the Canada West Conference's top seed for the playoffs. Manitoba came out of the break two points back of the Pandas for first-place in the conference, and they started goaltender Lauren Taraschuk on Friday. At the other end, head coach Howie Draper was off in Japan coaching the Canadian women's U18 team at the U18 World Championships, so assistant coach Leah Copeland handled the bench boss duties, opting to start Kirsten Chamberlin in a goaltending rematch of last year's Canada West semi-final! It wouldn't take Canada West's top teams long to engage in some north-south play as the track meet began. Both teams showed good chances early on, but both Taraschuk and Chamberlin were equal to the task. The game began to show more physical play as the period went on, but each team had an unsuccessful power-play through 20 minutes as they went to the first intermission deadlocked at 0-0. And early power-play for the Pandas got them rolling in the second period. Cayle Dillon's shot was redirected by Kennedy Ganser at 2:45 to put Alberta up 1-0! The period was a showcase for both teams' special teams as there were seven minor penalties called, but it would be Alberta would would make a second power-play count later in the period when Kelsey Tangjerd set up in front of Taraschuk and tipped home an Abby Krzyzaniak blast to make it 2-0 at 10:54! Alberta was rolling at this point, using their speed and skill to skate circles around the Bisons, and they'd strike again before the end of the period as Autumn MacDougall turned on the jets down the left wing and fired a low shot to the far post that eluded the pad of Taraschuk to make it 3-0 at 16:30! At the end of 40 minutes, the Pandas held a 3-0 lead over a listless Bisons squad. Now you might be thinking this game is over, right? Whatever was said to the Bisons in the second intermission by coaches Sean Fisher and Rob Voth seemed to light an inferno under the Bisons. First, Jordy Zacharias tipped an Alex Anderson rocket from the point past Chamberlin on the power-play that carried over from the second period at the 32-second mark to make it 3-1! Following another call against the Pandas, Lauryn Keen took a cross-ice pass on the left face-off dot from Jenai Buchanan on the right point, and she wired a shot over Chamberlin's right shoulder at 5:44 to make it a 3-2 game! With the crowd and benches energized once more, these two teams brought the fire for the remaining 14 minutes of the game with chances at both ends of the ice. However, the Bisons simply could not find one more puck to push across the Alberta goal line as the Pandas held on to win by that 3-2 score! Kirsten Chamberlin made 22 saves on the night for her sixth win of the season while Lauren Taraschuk absorbed the loss in 32-save effort. SATURDAY: With Manitoba now five points back of Alberta in the standings and UBC breathing down their necks just two points back of the Herd, Manitoba needed a big win today. The Pandas, of course, weren't about to let Manitoba up off the mat without a fight, so they came in looking to wrap up a weekend sweep and stand eight points above their next closest competitor. Lauren Taraschuk was back in the net for Manitoba while the Alberta goaltending carousel continued with Halle Oswald getting the start for the Pandas. The first period set the tone for the game as both sides pressed for chances, but were denied by the netminders and some solid defence. Alberta would hold a 10-8 lead in shots, but the game would remain tied at 0-0. The second period? More of the same. In what seems to be a common trend for games featuring Alberta and Manitoba when playing in Winnipeg, we'd go to the third period still tied 0-0. And wouldn't you know it? We saw more goaltending and defence in a period where Manitoba killed off an extended 5-on-3 power-play opportunity for the Pandas late in the frame. It was off to overtime tied 0-0, but Alberta had a commanding 28-19 lead in shots thanks in large part to that extended power-play time. The four-on-four overtime period was controlled by Alberta for the most part, but Manitoba had a couple of chances. The Pandas couldn't find a way to break the Manitoba defence or find a seam on Taraschuk, so we'd go to double-overtime still tied at 0-0. We would finally see a winner here. After Manitoba killed off a penalty where they had a glorious chance to end the game, Alberta came back and used a bit of a cycle to cause a bad switch by the Bisons defenders which allowed Abby Benning to walk into slot where she zipped a shot low on the blocker side of Taraschuk and just inside the post to give Alberta the 1-0 double-OT win! Halle Oswald was outstanding in her return to her home province as she made 23 saves for her fifth win and fifth shutout of the season while Lauren Taraschuk did all she could, but came up just short in a 34-save effort. With Alberta winning all four games against Manitoba, they own the tie-breaker if Manitoba were somehow able to catch the Pandas. That being said, Manitoba needs finish the season ahead of Alberta if they want the top seeding for the playoffs. Needing seven points with five weeks to go might be a virtually impossible task with how Alberta has played this season, so Manitoba needs to change their focus and worry about holding off UBC and Saskatchewan while hoping they get a pile of help from everyone else when it comes to Alberta losing. UBC may lose their hold on third-place next weekend with their travels to Clare Drake Arena in Edmonton. Saskatchewan has Regina in a home-and-home series, and they'll be looking to not only overtake UBC but possibly catch and surpass Manitoba with a little help from Mount Royal. It's almost a certainty that two of Manitoba, UBC, and Saskatchewan will host quarterfinal games if Regina loses both this weekend to the Huskies, but it's certainly up in the air as to who will play when. Lethbridge has a glorious opportunity to really put pressure on Regina and Mount Royal if they can sweep the Dinos next weekend. Having Lethbridge in the mix for a playoff spot is certainly a huge success for them, and I'm hoping they can find a few more wins to make things interesting. While it's way too early to talk about all the various tie-breaker scenarios, having seven teams competing for six playoff spots is always good for hockey. There's still a ton of hockey to be played with 30 total points on the line for each and every team. Alberta can clinch a playoff spot this weekend if they earn five of six points from UBC, making them the first team to qualify for the postseason. If Lethbridge were to lose both games, Alberta would clinch a spot regardless of wins or losses while Manitoba would clinch a playoff spot as well with five of six points earned against Mount Royal. The postseason picture is starting to come into focus as we get closer, and there should be some solid hockey played down the stretch with every single team needing points. We'll see who sits where upon the conclusion of next weekend, but I have a feeling that there will be movement in the standings before all is decided.